Networking makes sense for a large — or even small — offices and individual computer owners. Computer networking is about sharing resources. These include disk drives and the files and programs that live on them, printers, and modems. The networking hardware provides the connection between each computer. The networking software ensures that communication takes place. If you decide to buy a computer and put it on a network, whether at home or in an office, you must ensure that it comes with the proper network hardware. That hardware is the network interface card, or NIC ("nick"), also known as a network adapter. Most desktop computers sold now, and nearly all laptops, come with a NIC included; typically, as part of the chipset on the motherboard. The NIC is featured prominently in the advertising, or you can easily confirm that the computer has a NIC by checking for the telltale RJ-45 port on the back of the console. If a computer doesn't come with a NIC, you can easily add one. Beyond the NIC itself are two other things to look for: whether you want wireless networking and the NIC's speed. Generally speaking, networking hardware is the same for all desktop and laptop computers, whether they're Macs, PCs with Windows, or even PCs running Linux. The RJ-45 is merely the connector. The port itself is referred to as 10BaseT, 100BaseTX, or 1000BaseTX, depending on the NIC's speed. NICs are rated by their speed in Mbps, or megabits per second. Common speeds are 10 Mbps, 100 Mbps, and 1,000 Mbps, or 1 Gbps. Faster is better and is more expensive. For wireless networking, the speed is measured in megabits per second (Mbps), just like with wired NICs. Most wireless NICs talk at between 11 Mbps and upward of 50 Mbps. Networking requires additional hardware, which can be purchased at a computer store or any office supply store. You do this after you buy the computer, though some dealers may offer network setup as part of your computer purchase agreement. To connect the computers, you need special networking cable — unless everything is wireless, in which case you still need cable, but not as much. Today's computer networks need CAT 5 cable, also known as "twisted pair," though four sets of twisted pairs are usually inside the cable, for a total of eight wires. (The network uses only two). The length of cable you need depends on how far each computer is from a central location. That's the place where you find the hub, switch, or router. The CAT 5 cable has an RJ-45 connector at both ends. You can connect either end to the computer; the cable isn't fussy about which way it's pointing. Special CAT 5 cable is required if you're running the cable through crawl spaces, attics, or heating ducts. It's called plenum cable. You can find standard-length, ready-made CAT 5 cables at any computer or office supply store. They come in lengths up to 30 feet or more. At the center of the network is the gizmo into which you plug all the network cables from all the computers. This gizmo is called a hub, switch, or router, depending on its powers and capabilities, as well as how much you paid for it. Hub: This is the cheapest way to connect computers on a network. It's basically a box with several ports on it, one for each computer on the network. The hub helps transfer information from one computer to the other over the networking cables. Switch: A switch is basically a better, faster version of a hub. Router: The best way to connect your computers, especially if you plan to add a high-speed modem to the network, is with a router. The router not only connects the computers but also helps wisely manage them. It also helps put up a firewall between your computer network and the Internet. Note that the wireless hub, switch, or router may require a wire to connect it to the high-speed modem, as well as to other wire-based computers on the network. Ensure that whatever hub, switch, or router you get matches the fastest speed of your network. Placement of the wireless hub or router is vital. Wireless networking has an effective range of only several feet. The best way to set up a wireless network is with the hub or base station (router) in the same room as the wireless computers. The Apple AirPort wireless base station is a type of router. The AirPort can be used with both PCs and Macs, as long as the PCs have a compatible 802.11g NIC. Wireless routers must be configured immediately after you set up your network. Right away, you need to set a new password for the router and limit access to only those computers on your wireless network. This is an area where a specialist comes in handy. The final hardware goodie your network may need is a high-speed modem. This device is generally attached directly to the hub, switch, or router, as shown in Figure 1. In fact, most routers have a specially marked RJ-45 jack for the high-speed modem. 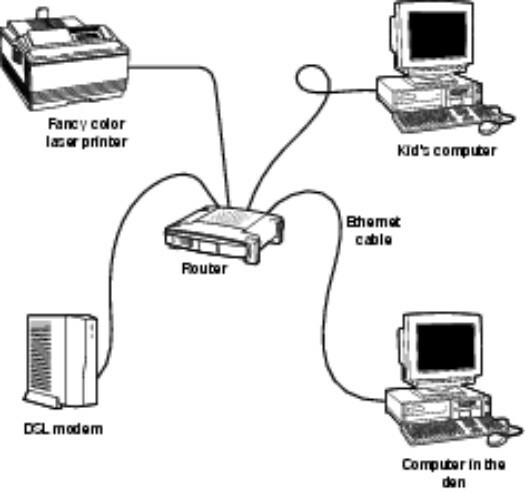 The rest of the jacks are for plugging in other computers or shared resources, such as a networked printer (shown in Figure 1).